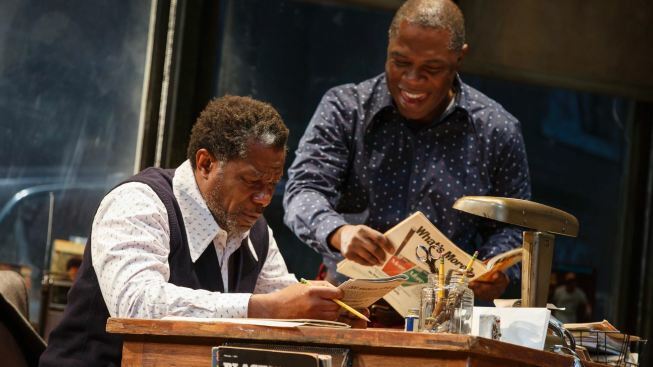 John Douglas Thompson as Becker and Michael Potts as Turnbo in August Wilson's "Jitney," directed by Ruben Santiago-Hudson. Below, André Holland and Carra Patterson. 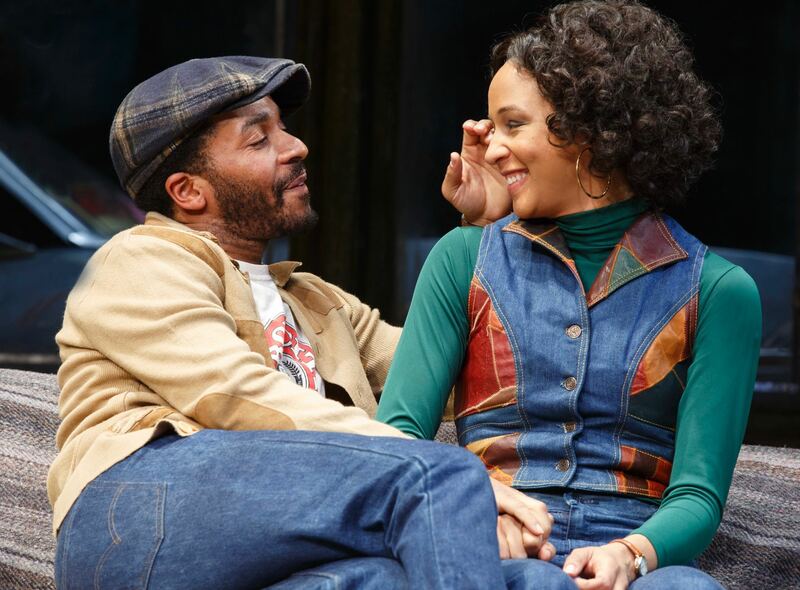 Until this year, “Jitney” was the only one of August Wilson’s “Century Cycle” plays to have never been performed on Broadway. Now it’s finally arrived, in an artful and melodic staging directed by Ruben Santiago-Hudson, one of the most well-regarded interpreters of works by the “Fences” playwright. Set in a downtrodden corner of Pittsburgh in the churning, post-civil rights era 1970s, “Jitney” tracks a group of men scraping together a living driving unlicensed cabs. Though the business has no formal oversight, its owner, Becker (classical stage actor John Douglas Thompson) tries to instill a sense of pride in his motley crew. “The people got a right, if you hauling them around in your car, to expect the brakes to work,” he tells his drivers in one enduring monologue, as the gaggle of men decide to battle the city’s plans to raze their business in an eminent domain grab. That larger imbroglio unfolds as Becker faces a more personal tumult—the release from prison of his son, Booster (Brandon J. Dirden). Twenty years earlier, Booster was imprisoned for killing a white woman with whom he’d been having an affair, after she lied to law enforcement about the nature of their relationship. Booster served his time and now, at 39, wants to make something of his life. But first, he’s arrived at his father’s shop, just wanting to heal a rift with the older man, who believes the son’s crime led his wife to die of a broken heart. The marvelous Thompson is dignified, but not unyielding, as owner of the jitney shop. He’s the kind of man who will make a reluctant exception to his “no drinking policy,” to protect an older employee who can’t stay on the wagon. Becker is at his most relatable when talking to his son about his own past humiliations, the times he had to choose between standing up for himself and swallowing his pride—and how what kept him going was the dream that his son would seize upon his academic gifts and, finally, bring a just-out-of-reach dignity to the family. As Booster, Dirden is determined to connect with his father, but unapologetic for his prior deeds, actions he carried out so as not to feel “shrunken in size,” the way he believes has father has been. Michael Potts is a firecracker as Turnbo, the shop gossip, an unstable if entertaining fellow who once pointed a gun at a man over a 50 cent debt. Turnbo runs off at the mouth dishing on people, even as he argues he’s not one to meddle in the business of others. You can’t play that sort of thing ironically, and he really pulls it off. André Holland and Carra Patterson are Youngblood and Rena, the play’s youngest characters. Constitutionally itchy, Youngblood needs to find a foothold in order to support his family, but is relentlessly frustrated with pushback from forces beyond his control, like an unseen bank mortgage officer and his girlfriend. Patterson is, indeed, effective, but I’ll admit to finding her surprisingly unsympathetic, since she makes demands apparently blind to the support Youngblood is already giving her. Doub (Keith Randolph Smith), Becker’s second-in-command, is a grounded, self-aware Korean War vet who does what he “needs” to do, even when it’s not what he “wants”: “Too many black folks get them mixed up,” the character argues. Stage vets Harvy Blanks, Anthony Chisholm and Ray Anthony Thomas provide strong support as older denizens of the jitney shop, each working some angle to get through his days. During the age in which “Jitney” transpires, legal racism may no longer be permitted, but city power brokers are indifferent to the idea of black prosperity. Wilson’s vehicle is a group of men driving second-class cars, but tired of being treated like second-class citizens. The MTC's ensemble does a glorious job bringing home that message. “Jitney,” on sale through March 12 at MTC’s Samuel J. Friedman Theatre, 261 W. 47 St. Tickets: $60-$140. Call 212-239-6200.